Fond as I am of British culture, I’ve spent precious little time in England – less than a week, to be exact. So, I’m no expert, but I understand that some of our friends across the Pond refer to a neighbourhood pub as their “local.” As far as bar-related colloquialisms go, it’s the kind of term that’s packed with meaning. 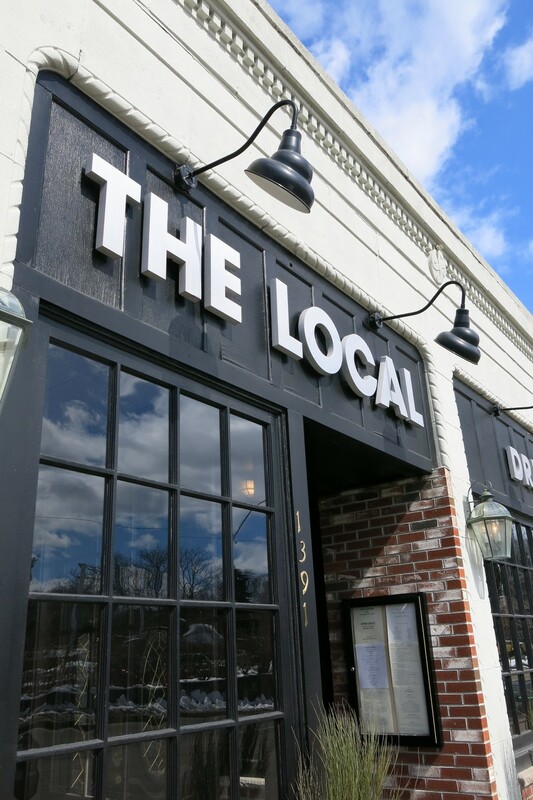 “Local” implies a certain sense of comfort and familiarity – the kind of place where you and the staff are fairly well acquainted after many nights of seeing each other from opposite sides of the bar. Maybe the bartender knows your drink of choice or your favorite dish. 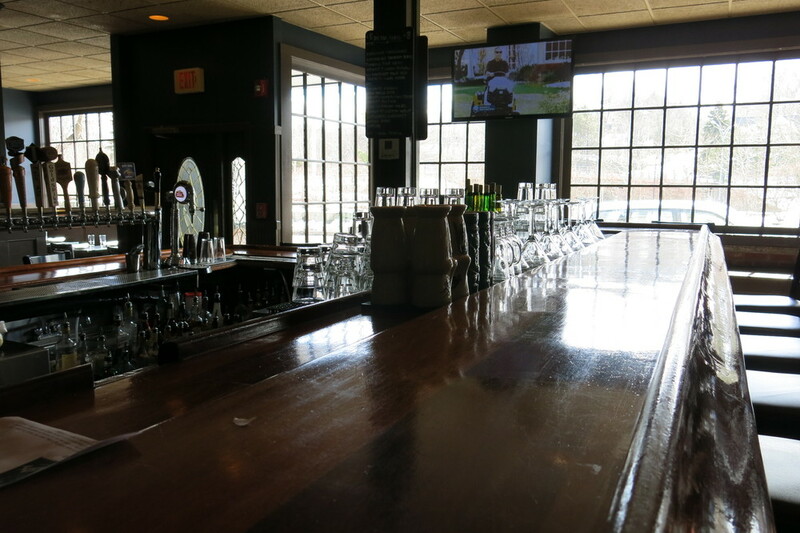 Perhaps you stop in once a week for a pint and to chat with a few other regulars. Whether that’s what the owners of The Local had in mind when they designed it, I don’t know; more likely, the name refers to their locally sourced food, beer, and spirits. But the casual, convivial atmosphere of this Newton bar is exactly what might prompt someone to make it their local. 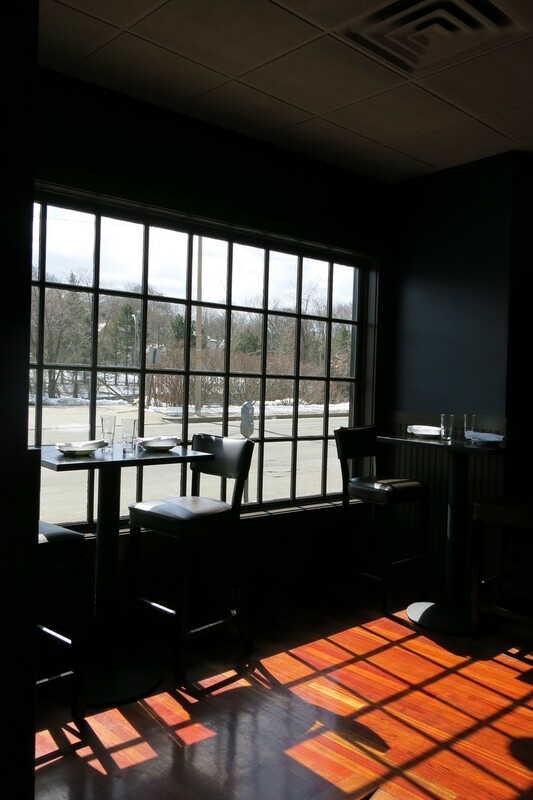 At once upscale and cozy, The Local has a contemporary look with an old personality. Framed black and white pictures on the wall suggest deep New England roots, and even though The Local has only been open since 2008, it feels a true neighborhood fixture. Dark blue and wainscoted walls, hardwood floors, and candle-lit tables set the scene for a quiet, intimate dinner. But at the center of the room is a square, two-level bar with about 18 seats, where the atmosphere is decidedly lively. Large picture windows overlooking the street add a classic sense of style and let in plenty of natural light during the day. Not that there was any natural light beaming through the windows when Melissa and I were there. We stopped by The Local on yet another raw, dreary evening in what’s felt like a neverending winter. But it was a night tailor-made for comfort food in a warm pub, so we got a couple of seats at the fairly crowded bar and began perusing the cocktail list. If my experience at the Gaff taught me anything, it’s that I shouldn’t be shocked to find a bar outside Boston that has a selection of creative, well-conceived drinks. 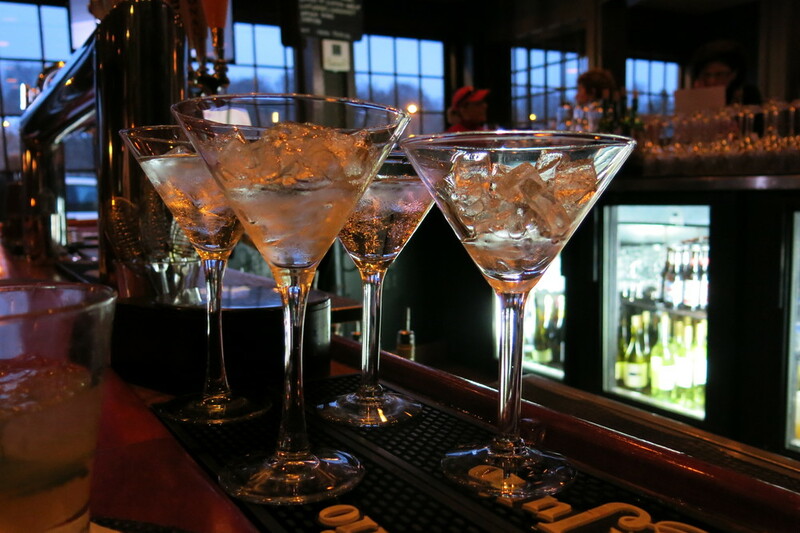 But what jumped out at me about The Local’s cocktails was how many of them employed spirits from regional distillers, like Bully Boy, Berkshire Mountain, and GrandTen. To be sure, The Local isn’t the only bar that promotes locally sourced food and regional beers; but I think this is the first time I’ve seen that philosophy extended to cocktail ingredients. I don't know what goes in these funky glasses, but I wish I'd ordered one! Mel went with the Bully Cocktail, made with Bully Boy white whiskey, fresh lime juice, grapefruit juice, agave syrup, and mint. It was a pleasing mix of flavors, with the mellowness of the white whiskey and the zing of the citrus, along with a nice freshness contributed by the mint. I opted for the Cubano Be Cubano Bop – spiced rum, fresh lime juice, agave, and mint, with a prosecco float. A vibrant update of the traditional Old Cuban cocktail, The Local’s version swaps out white rum for spiced, champagne for prosecco, and simple syrup for agave. As the drinks took the chill out of our bones, we moved on to the food menu. Here, too, the focus is on the New England area, and the menu is divided into different…um…things: Snack Things, Small Things, Flatbread Pizza Things, and Bigger Things. But there are no boring things ­– the menu is composed of fun and inventive options like fried pickles with spicy mayo, truffle parmesan fries, seared tuna sashimi, and a catfish po’ boy, to name a few. They also have an eclectic list of nightly specials (which are not, unfortunately, called “Special Things”), which is where Mel got her Southwestern turkey burger sliders. 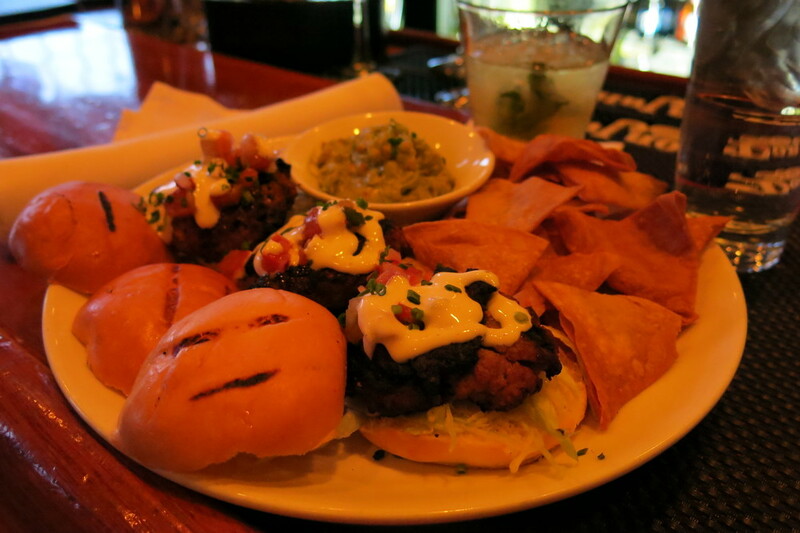 Served with tortilla chips and house-made guacamole, the burgers incorporated a rich blend of spices and, as sliders tend to be, were just adorable to look at. I was sorely tempted by another of that evening’s specials, turkey chorizo chili. But how could I turn down a burger described as “sourced by the ‘Godfather of Meat, John Dewar’”? I mean, what must one achieve in life to be honored with such a lofty title? Whatever it was, John Dewar, a local purveyor of meat, did it. The Godfather of Meat’s burger was solid and satisfying, though nothing remarkable. 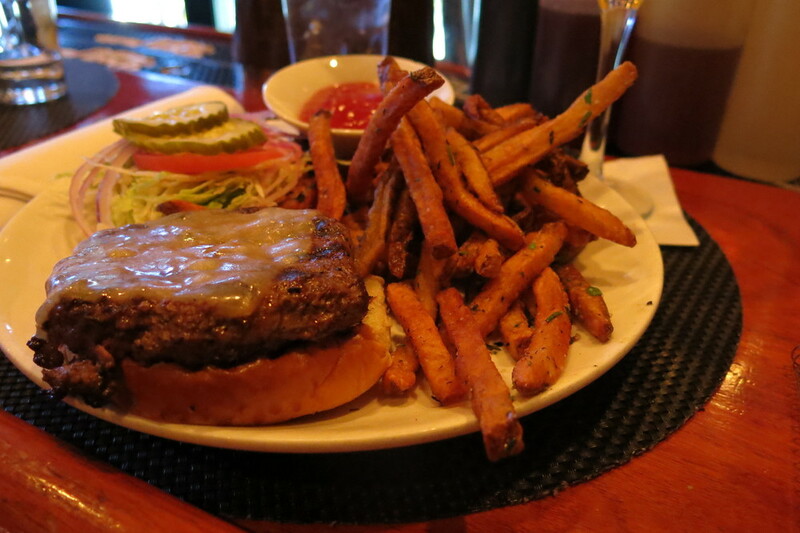 The real story was the fries – seasoned with rosemary, they were crispy, awesomely spiced, and utterly delicious. If the fries have a godfather, I’ll kiss his ring. As I tried to restrain myself from eating rosemary fries by the fistful, I found myself struck by the obvious neighborhood vibe. Sure enough, this seems to be many people’s “local,” as I heard customer after customer talking amiably with various Local staff. And even though we certainly didn’t know anybody there, it was easy to get swept up into the atmosphere. The bartenders, Stephanie and Billy, were chatty and happy to discuss the menu or offer suggestions. A woman sitting next to us asked Mel about her sliders and then ordered her own after one of the bartenders encouraged her to forgo her usual order. As my french fry feeding frenzy finally wound down, I began debating my next cocktail move. 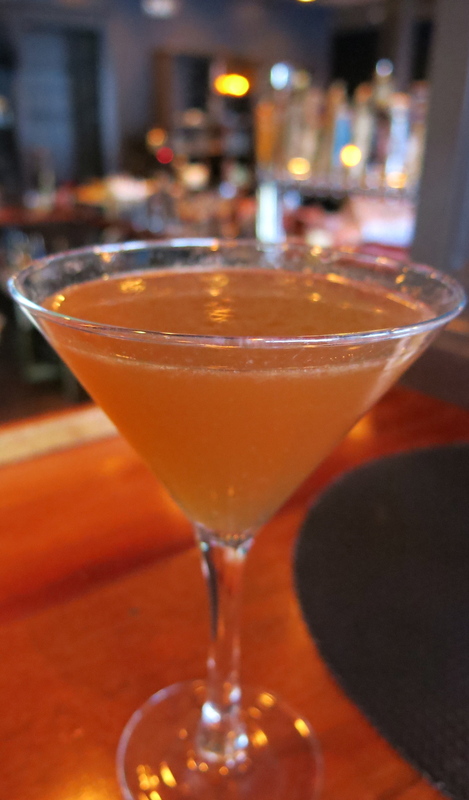 Conflicted, I asked our bartender, Stephanie, for her advice, and she steered me toward the Ward 8, the signature drink of Boston’s historic but recently shuttered Locke-Ober restaurant. 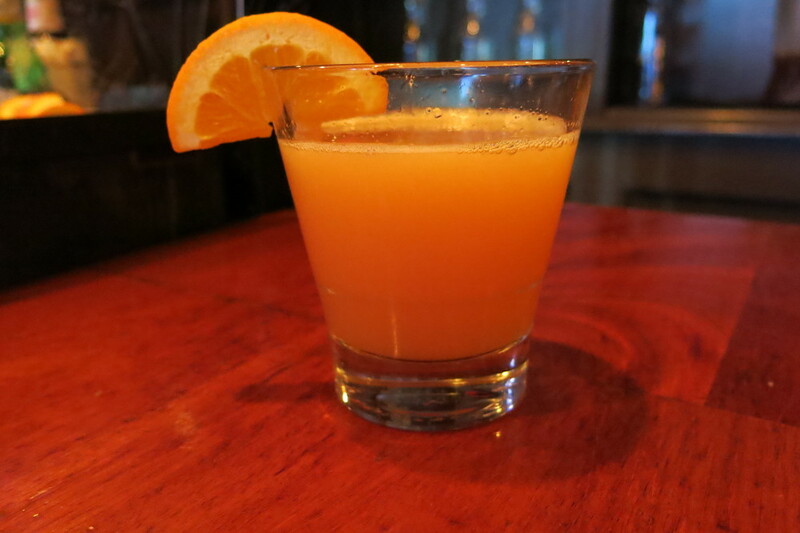 I never had one there, but The Local’s version, made with Vermont’s Berkshire Mountain Bourbon, fresh lemon juice, orange juice, and house-made grenadine, seemed like a well-made tribute to a classic drink. Nowhere is The Local’s devotion to New England-made goods more obvious than with its beer selection. Ten of the 13 draft beers are popular local microbrews like Clown Shoes, High and Mighty, and Slumbrew, along with more mainstream favorites like Harpoon and Sam Adams, and a few entries from New Hampshire and Maine. I went with the Mayflower IPA, which had some pretty intense hops going on but also a noticeable citrus flavor. 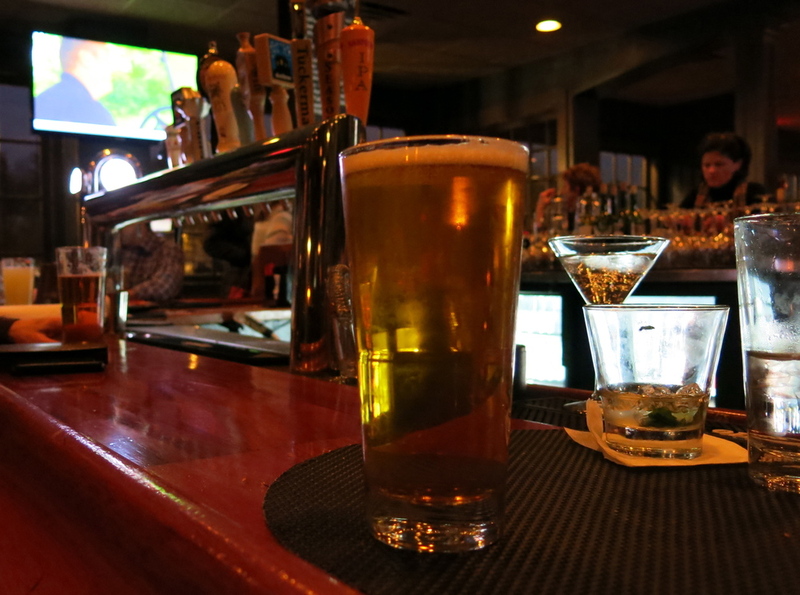 The draft beer comes in 16- or 20-ounce options, which is convenient. But if this place ever becomes my own local, I’m sure they’ll just give me the 20-ounce without even asking. OK, so The Local bases much of its menu on ingredients made here in New England. What’s the big deal about that, anyway? Would your experience there be somehow diminished if that were not the case? I doubt it. But there’s something satisfying about enjoying a great meal and a good beer made right in your my own backyard, so to speak. It contributes a certain sense of community. And speaking of community, The Local has the neighborhood vibe down pat – and that’s something you can’t simply manufacture. It’s the kind of atmosphere that grows over time when customers return again and again, but I think it starts with a friendly environment and a menu that balances consistency with innovation. Affordability doesn’t hurt, either, and the prices here are a bit lower than you’ll find in Boston. Our cocktails were $9 and the beer was $6 (for 20 ounces, of course). The sliders were $16, and my burger was $12 ($11 if you don’t want cheese). And with fun snacks and small plates to share, there’s something for almost any budget. What I’m curious about is whether the things that make this place worth visiting – an eclectic menu, creative specials, and a sense of community – will change as The Local expands. 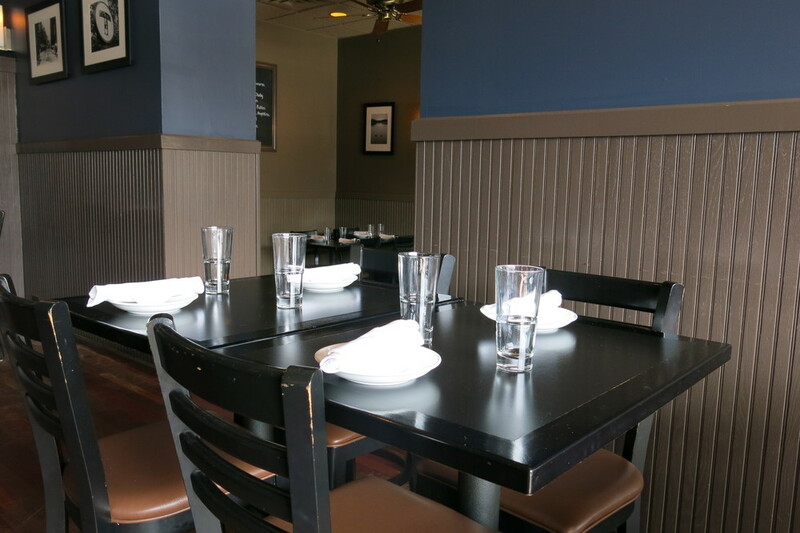 With locations opening soon in Wellesley and Wayland, and possibly more in the works, it would be unfortunate if The Local’s character succumbs to the blandness of the typical suburban restaurant chain. Hopefully, any new location will be able to grow at its own pace, develop its own personality, and become, for customers, a true local.